Note: Quora does try to sell it by saying that by having you signed in we can ensure we are showing you relevant content based upon your previous browsing information but wont this be a big turn off for first time users who want to just read about something. I hate all the sites that use these technique to get more signups. I may signup but when I find out that the 'hidden content' is not interesting and unique I will never ever get back to that site again. This is probably the exact reason why Stack Exchange sites are more popular than Experts Exchange. Unless and until your content is really unique and there is no other site giving it, or there are some PhDs and professors who give answers only on your site, you should never irritate your site's visitors like this. Doing that will probably result in more people signing up, but will also likely result in fewer people using the site. I'm extrapolating here from other sites that for example only allow registered users to see images, or news sites that only allow a certain number of articles read per month for non-registered users. In both situations they have been found to increase registrations. So it all depends on which is more important to you. More registered users or more total people reading the site. i own over 3000 apps across all apple machines (including adobe software on mac), and many android apps as well. what gets me to buy is this: the app provides me with an excellent, fully functional, experience free. it also lets me know i can have even more if i buy. it informs but doesnt nag and doesnt do sneaky self-promotion, and is mostly free of other such nuisances. if two apps are equally good, or close, the one with the handsomer icon wins. if an icon is flatout ugly, i will always be searching for a replacement that does the same thing without make my eyes hurt. hipstamatic is a prime example. its filters are so good you want them all. its posible to grab the app and shoot fine photo with just the default filters that come free, they regularly give new "freepaks" (that go paid after a day or so, meaning get them free quickly or buy them at your leisure) and also regularly make new paid ones. i buy every single one, as do many, many people. but i might not have even tried it had it not been free and functional as such. using it and seeing its excellence is what turned me into a buyer, ongoing. other examples: alien blue, camera+, friendcaster, fruit ninja, talkatone, angry birds, paper by 53, twitterific...notice anything? these are all top apps. users can have a complete and excellent experience without every buying anything. if you want more, more features or more ad-free or some such, you buy. with talkatone, i finally bought simply from gratitude. its been my main calling app for over two years, and the support (seldomneeded btw) is prompt and good. with truly good apps,its hard to imagine anyone /not/ wanting more. this, from someone who eschews adblock. my son programs professionally and i occasionally beta test. i understand that people need to live. but im guessing teasing (unless done really, really skillfully and sparingly) would yield more losses than gains. let me /experience how it is to enjoy the app./ let me use it daily until it becomes essential to what i do. then I'm hooked and will certainly upgrade. its much like....drugs. while I'm here: dont remove features after someone's paid for your app. or if you do, please read the reviews amd if the feature is widely and loudly missed, restore it. i quit using one app because they removed the two reasons i used it: it was the fastest of its kind, and it had a stunning fliter no one else had (i do a lot of iphoneography). and dont force users to do anything! (unless its essential for using the app at all) i quit using one app -- that had paid me to help with filters as they were growing -- because they force users to add tags to everything. i don't have time for it. if the image cant speak for itself, i as an artist have missed the mark. let those into tags tag, or code in auto tags if you insist on tags for everything, but dont try to make me do something unnecessary a thousand times over.esp when you have plenty of competitors who allow me a choice. if you make a great app, let people actually use it so they /know/ it's great, and refrain from being sneaky, bossy, or stingey...you should be able to get many upgrades to paid. If user experience is a top priority, than making the content as accessible as possible is paramount. You should be empowering your users, not inhibiting them. 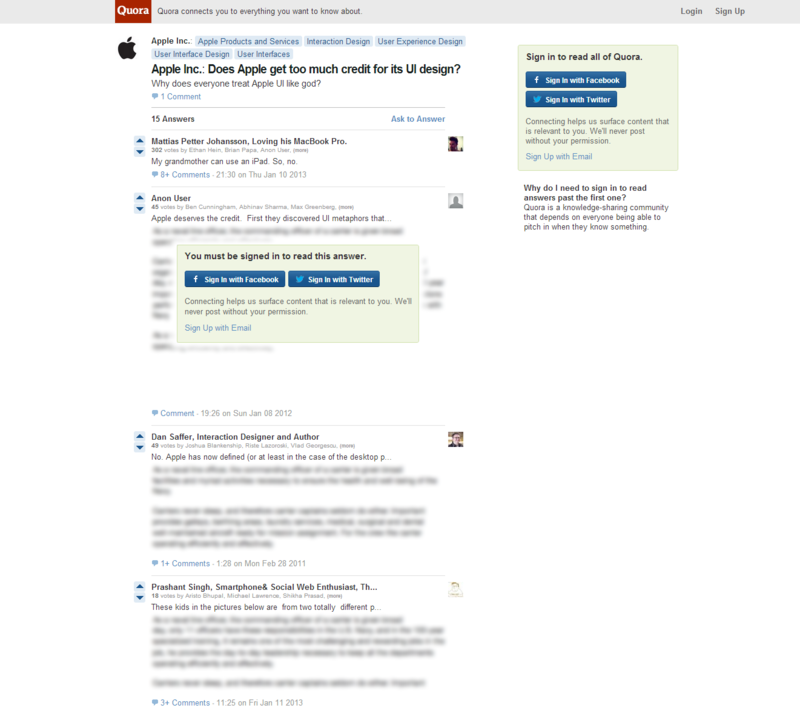 The comment from Quora wanting you to sign up for a better experience is self-centered and seriously deters from the users experience. In your example, the user isn't randomly browsing the web. They were sent here pointedly and already found what they are looking for. The blurred text is just an artificial boundary to build membership. There's nothing wrong with Quora wanting to encourage new member signups, but I think this approach is inconsiderate and shows that they care more about themselves than their users. It's hard to create a great experience with that attitude. Let me back this statement from personal experience. I launched a Quora like community for science geeks but kept it behind a "Sign-up wall" initially. It got featured on the front page of Hacker News and did receive 5000+ sign ups within 10 hours or so. Seems awesome, right? Well, my happiness lasted for just about a day. Lots of people started complaining about the sign up wall on Hacker News thread. According to analytics, more than 25k people visited the site and a staggering 20k just left from the registration page. That was a big loss! Moreover, Google bots were not able to index the content properly. I realized my mistake and all content was made available without signing up, much like Stack Exchange sites. Registration was required only for contributions. This turned out to be a good move. There were more visitors, people started contributing to the site and my search rankings went higher. If people love your content, they will engage with it and you will have a better community. There's no need to "force" users to sign up. Aim for engagement and not just registrations. Quora does this because they have a "real name" policy. Meaning, they only want contributions from users' actual identities, vs anonymous avatars. They don't tell you this when you're casually viewing the site like this, but I think they are essentially trying to block access to the site in order to ensure that the only people with full access to the site are actual users who have identity verified accounts. My opinion is that this is more of a side effect of attempting to create a forced community, than a design pattern for the sake of getting people to sign-up. Don't ask me how they do it, I just know that they do. Edit: I agree with your engineer - it is annoying. I personally think it's incredibly stupid and narrow-minded, and potentially turns off a lot of people who even went through the sign-up process from engaging in conversation with other people on the site, particularly since it's almost completely opinion-based, and especially if your opinion is not in the majority or you disagree with someone who is considered a known expert in your field. However to answer the question about research, I mean...if people feel that there's value in signing up, either by sharing their opinion or by getting information, then they will sign up. There is no doubt in my mind that Quora would increase their user base and SEO substantially if they removed their "real name" policy, thus removing the need to sign up to read more information. Not the answer you're looking for? Browse other questions tagged login dark-patterns or ask your own question. How to visually suggest to the viewer that there is more than meets the eye in a elegant, neat looking way? How to handle requests to pages for logged in users that shouldn't be looking for them? Why do sites like stackexchange have users sign up for each site? Is it really much helpful for users to provide them multiple options to sign-up or sign-in? Why not sign up new users when an unknown email is entered into “forgot password”?